In the last few years, our family has been closely involved with a number of weddings. I have thrown a several showers, but my very favorite one was for one of my nephew’s fiancees. Entertaining is one of my favorite creative endeavors. She is a country girl at heart and I tried to think of a theme to suit her tastes. Taking into consideration that the bridesmaids dresses were chocolate brown, I decided to go with a sunflower theme. 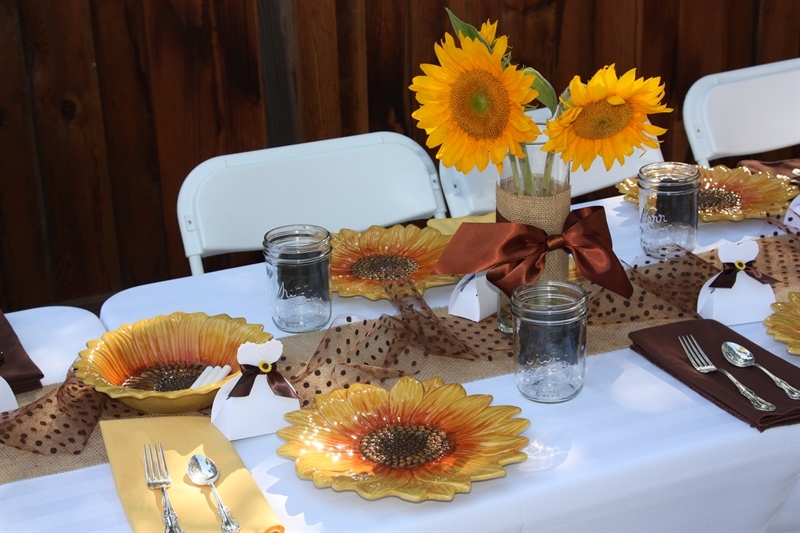 I knew that I wanted to feature sunflowers and burlap. I was very pleased with the results and so was the bride! I set the tables with white tablecloths and alternated between brown and gold napkins. Down the center of the table, I ran a strip of burlap and topped this with some brown polka dot tulle to soften the look. 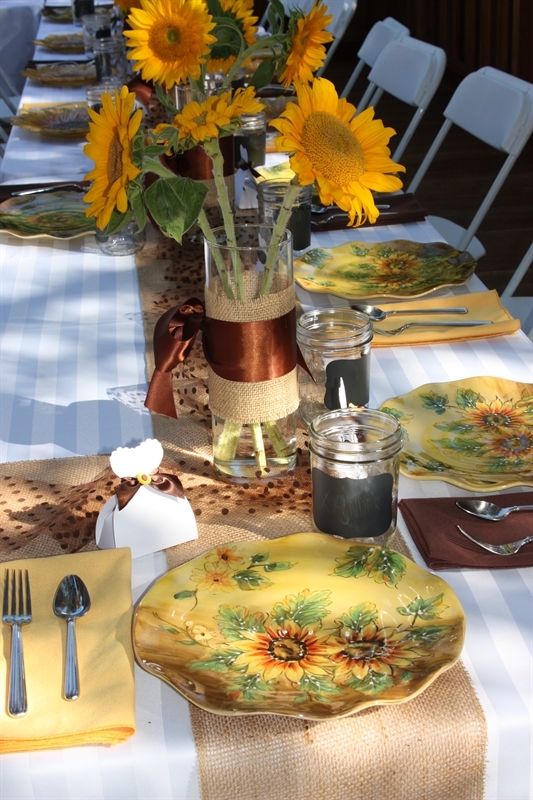 I was lucky to have a friend that offered me her sunflower plates as I was planning this event. We used mason jars for the beverages which I was able to borrow from another friend who had already invested in the Martha Stewart chalkboard labels. I set out pieces of chalk for our guests to write their name on their glass. The “Happily Ever After” banner was my first foray into painting on burlap. I cut the triangles of burlap, folded over the top and sewed a quick line to give me some way to string up the banner. I then made “stencils” for my lettering out of vinyl on the Cricut. The font used was from the Creative Memories ‘Tis the Season cartridge. I took chocolate colored brown acrylic paint and filled in the stencils. To add a little more zing the the banner, I sprinkled brown glitter on the paint immediately after I painted the lettering. Then I removed the vinyl stencil. I let them dry and strung twine through the tops of the triangles. I completed the banner by adding a big satin bow to each end. I kept the flowers simple. I took glass cylinders and wrapped them with a strip of burlap. To make sure the burlap stayed in place, I carefully ran a little hot glue to attach the burlap to the glass. I added the thick ribbon tied with a floppy bow. The burlap, tulle and ribbon all came from one of my very favorite web stores – Papermart. I got out my trusty Cricut to make the boxes for the favors. The bride dress boxes were cut out of heavy white cardstock. The waist of the dress was tied with a brown ribbon and then a sunflower button was added as embellishment. The boxes were filled with chocolate covered coffee beans. I was afraid that they may melt and ruin the boxes, so I put the coffee beans into a clear plastic bag before putting them in the box. 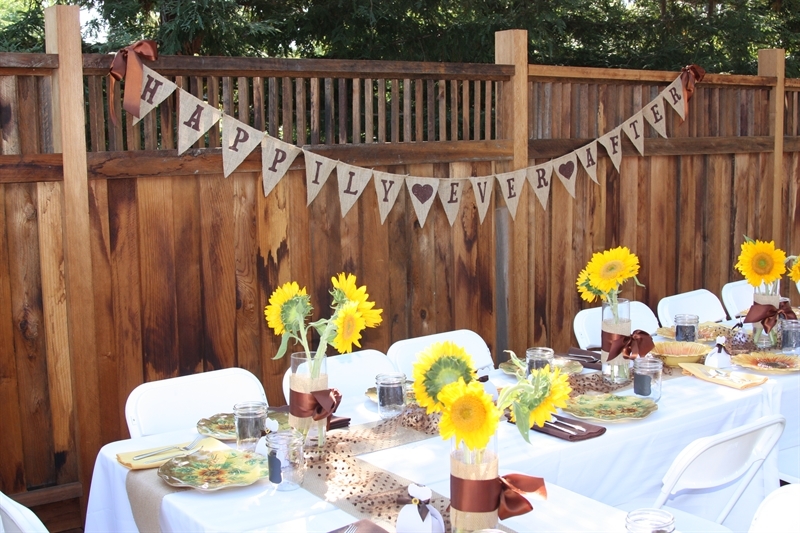 Categories: Cricut, Entertaining | Tags: Acrylic paint, bridal shower, burlap, burlap banner, Cricut, Happily Ever After, Martha Stewart, Stencil, sunflower shower, sunflowers | Permalink.